Yellowstone Chip Samuell’s contributions as an entertainer and wrangler caught author Nan Weber’s imagination. After finding traces of Yellowstone Chip’s writing at the historic OTO Dude Ranch north of Yellowstone National Park, Weber tracked Chip’s history. In the course of her research, she found Chip’s memoirs, his music, his cartooning, and his family. What has emerged from these home sources and civil records is the picture of a first-class wrangler and entertainer during the heyday of dude ranches and singing cowboys, a fascinating story which you will witness in the pages of Singing In The Saddle: The Life and Times Of Yellowstone Chip. This book documents Chip’s travels from his Illinois childhood home to the majesty of the Western United States. Within the book, tunes are introduced highlighting different portions of Chip’s musical development. His lively journey encompasses music, cowboy life, and, most of all, people. 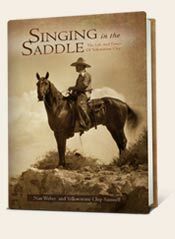 Backed with nostalgic photographs and written works by Chip, Singing In The Saddle engages you with a story of a true singing cowboy. Visit Nan Weber's web site for a preview of Yellowstone Chip's music.